If you prefer turn button fastening rather that press stud but you still want the three position option to hold your Speedcuffs or other rigid handcuffs at your preferred angle then this model is for you. 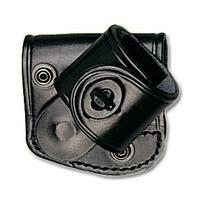 There is a further weight saving as there is no actual pouch for the base of the 'cuffs to sit in. Weight 98 grams or 3.3 oz. Made of leather.